Republicans were supposed to run on their tax cuts. Instead, they’re running away from them. Stop voting for Republicans, if you don't think rich people are the ones who have been hurting pretty damned bad. So NotOnTV, why do you, instead, think it's so very good and right to vote for Republicans, even though rich people don't seem to be hurting bad? Are you a firm believer in trickle down economics as many Republicans are? Do you strongly believe that when taxes are cut, it will automatically force tax revenues to surge? Or is the issue too difficult for you to put into words? You sir are a true believer, those you believe in are not worthy of you. So much WINNING, but so much left to do. I believe in taking the boot heels of government off the throat of the businesses that drive the economy and job creation. You have a job, right? Look at the current stats. Tax cuts and suddenly revenue is at all time high. So yes that is working. Lowest unemployment rate EVAH for Hispanics and African Americans. If you want to consider that trickle down then Yes its working like Avenetti chasing an ambulance. yet another lie told by Townie. Those are NOT the theories of supply side economics, those are simply leftist talking points. Everybody, and their brother, except Townie, knows that increased revenues are NOT "automatic" (i.e., instant) - however revenues were in fact up. Is that too difficult to include in your rant? Nobody ever said that rich people were "hurt" by anything (another leftist talking point), everybody knows that when everybody's fortunes improve, that it also includes the successful, as well as the laggards. What exactly is your aversion to facts? Why does Townie dislike JFK so much? After all, he is the one who famously said “A rising tide lifts all boats.” JFK—the original supply-sider. What Townie and most leftists don't get is who the Mega rich are. Buffet (Old Man Potter) and Munger are hard leftists. Pretty much all of Silicon Valley Billionaires. Hollywood and its mega wealthy. Most NY banker investment types are left wing. The Mega rich are overwhelmingly leftists. Its the people in middle America that are business owners that see the ravages of taxation the Estate tax and insane regulation that tend to be Right minded. The article talks about 70% of the tax cut goes to the top 20% of earners...yeah, the top 20% pays approx. 80% of all income taxes. When you're in the group that pays 0% - 3% of all income taxes the cut you receive will be small to nothing. Why does this shock anyone? No, seriously, you and others on here are really the ones who need to wake up to the facts. Are you ignorant of the fact that tax revenues are not coming in fast enough to make up for the tax cuts? Are you ignorant of the fact that the Joint Committee on Taxation and the Tax Policy Center predicted that the tax cuts would add at least $1 trillion to deficits over the next 10 years, even after accounting for additional economic growth? Inflation sure won't help matters, especially if it worsens. No wonder Trump thinks the Federal Reserve has been acting crazy. Maybe you all are much more comfortable when it's the Republicans running up the deficits. Anyway, you better hope the economy will soar well beyond expectations to pay for those tax cuts and a recession won't set in to ruin things. Like it or not, Republicans govern like the rich are the ones hurting. So Republicans, especially on the House side, have been talking about cutting Medicare and Social Security to help deal with deficits. It will be difficult to get enough votes to do that in the Senate, though. Oklahoma Republicans are still strongly opposed to adding any more Medicaid, saying it would be wrong to do because it would force dependence upon the government. So what do they think Medicare and Social Security do to retired people? You can say those two government programs are not really welfare or entitlements, like Medicaid, because everybody had to pay into them while working. But you can't run away from the fact that you still end up with the same thing--a bunch of people dependent upon the government. Oklahoma serves as a warning as to what can happen from the result of tax cuts. For one thing, after enough suffering, Oklahoma, like Kansas, had to raise taxes. There could be no more waiting to see if oil was ever going to go back over $100 a barrel. So I'm now paying 3 cents more a gallon on tax, strangely enough not to fix roads, but rather to give teachers a $6100 raise. The wealthy old right wing also provide a loud counter voice to the left wing. The left and right absolutely refuse to listen to each other and helps explain the polarization in America. The people in between have had enough of their BS. Townie, might I interest you in a primer on static versus dynamic assumptions as well as base line budgeting. Remove baseline budgeting and give the President line item veto and see how quicly things come into balance. The "wealthy old right wing" are the Rokerfeller Republicans. They are best known for caving, higher spending and their desire to be liked by the liberal press. They hate Trump and they hated Reagan. Next time for tax cuts the middle class, who make up most of those 47% who do pay federal income taxes, should only be targeted. As a whole, people making around say, $100,000, contribute a lot to the economy. Among the many details in the report, the one reporters focused on was the CBO's forecast that the federal deficit would top $1 trillion in 2020, two years earlier than the CBO had previously said. And, naturally, most news accounts blamed the tax cuts. "U.S. budget deficit to balloon on Republican tax cuts" is how Reuters put it in a headline. But there's more to the story that the media overlooked. First, the CBO revised its economic forecast sharply upward this year and next. Last June, the CBO said GDP growth for 2018 would be just 2%. Now it figures growth will be 3.3% — a significant upward revision. It also boosted its forecast for 2019 from a meager 1.5% to a respectable 2.4%. "Underlying economic conditions have improved in some unexpected ways since June," the CBO says. 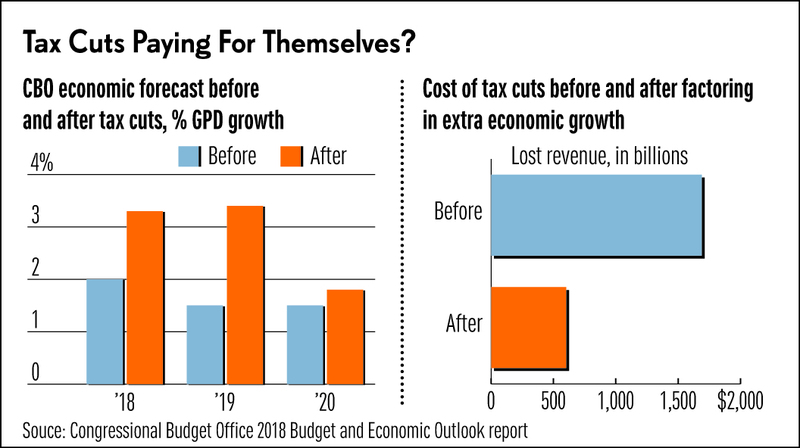 Unexpected to the CBO, perhaps, but not to those of us who understood that Trump's tax cuts and deregulatory efforts would boosts growth. In any case, the CBO now expects GDP to be $6.1 trillion bigger by 2027 than it did before the tax cuts. This is what we and other backers of the tax cuts had insisted all along. Not that tax cuts would entirely pay for themselves. But that the economic growth they generate would offset much of the costs. Tax cuts for everyone, or tax hike for everyone ---- everyone... even the poor. Everybody should pay tax. Period. I don't care if it's just one dollar. Everyone pays.